This is another one of those books which have different titles depending on which country the book is published. Mine was called Temeraire but it is also called His Majesty's Dragon. I have wanted to read this for a while as I have heard a lot of good things about the series. 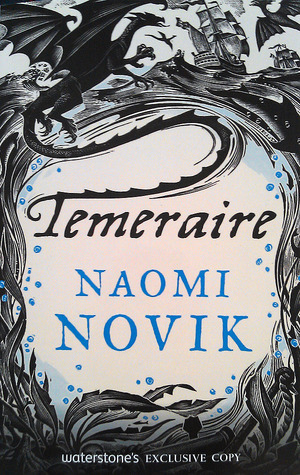 It is my first book by Naomi Novik. What a great combination of fantasy, historical fiction and alternate history! With dragons! I have only read one book before which was military based and I didn't like it that much but it was set in more modern times. But this book, set during the Napoleonic wars, I found really interesting. During these wars (in reality), no country had aerial squadrons which left battles to be fought at sea and on the ground but having dragons as part of the armed forces in this book gave the war a very different dynamic and obviously changed the course of the battles. The story focuses on Laurence, a Captain in the British Navy who upon “winning” a French battleship in a fight, took possession of not only the ship but also what was on it including a dragon egg. So it hatches out and they need to put a harness on it as quickly as possible to “tame” it. After drawing lots as to who would do this, they wait for the dragon to hatch. And just like a cat, the dragon chooses who it wants to be as his rider/owner rather than the guy who was chosen by lots. So from esteemed Navy Captain to Dragon Corp Captain, Laurence names his dragon Temeraire. Oh and I forgot to say that Temeraire is a talking dragon! Which I love! He is the true star of this book for so many reasons. Obviously, not being born to the Corp and Temeraire not being a native breed to England, both face difficulties trying to integrate themselves in to life in the Corp. I really liked the relationship between the dragon and Laurence. Other reviewers have commented that they do not understand the relationship but I see Laurence caring for the dragon as one would with a beloved pet dog… that unconditional love… but with the added bonuses that you can have an intellectual conversation with it (and it be two way)… that it can take you from A to B (and it flys)… and that it is a truly magnificent animal. 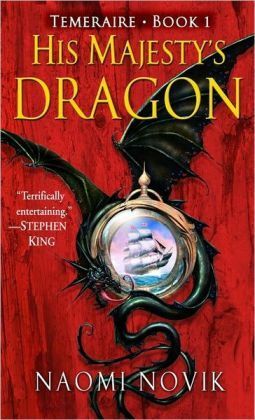 The book is set during the Napoleonic War and Naomi Novik sure seems to know her stuff on this time period and does a great job at setting the scene and showing us what it would have been like at sea and at home during those battles. I loved the aerial battle scenes as well as the training drills for the dragons and their crews. I have to say that I loved every minute of this book and I have added it to my Favourites shelf. I am very eager to continue on with the series and I can’t wait to hear more from Temeraire.